Fact or Faked: Paranormal Files is currently airing on Thursdays on Destination America. What is next for the Fact or Faked Team? 2-4-16 Destination America starts airing Fact or Faked: Paranormal Files on Thursdays. Welcome the newest Fact or Faked: Paranormal Files Team Member, Photographer, Lanisha Cole. Fact or Faked returns to Syfy in October part of the "31 Days of Halloween". Breaking News revealed on the San Diego Comic Con Red Carpet of the Syfy/E! Party by Jael de Pardo that Fact or Faked: Paranormal Files has been picked up for an additional 6 episodes! This is an addition to the previously announced order of 12 episodes. Looks like we will be having lots of Fact or Faked to look forward to! -Fact or Faked: Paranormal Files premiered Thursday, July 15, 2010 at 10/9c. -The Summer Finale aired on Thursday, August 19th. It was a six-episode season. -The Fact or Faked Team finished production on November 3, 2010 on the next six episodes for Season 1.5. -Fact or Faked: Paranormal Files returned on October 28th with the start of six all new episodes for Season 1.5. -Season 2 pick-up announcement on November 19, 2010! -Season 2 started filming in mid-December 2010. -Season 2 filming completed on March 4, 2011. -Season 2 started airing on a new night, Wednesday, March 23rd at 10e after Ghost Hunters on Syfy US. -4/26/11 Syfy announces an order of 12 more episodes to begin airing in October 2011. -6/27/11 Season 2.5 started filming. -7/23/11 6 more episodes ordered by Syfy. Revealed by Jael de Pardo on the red carpet at San Diego Comic-Con. -8/8/11 Fact or Faked Fall return date for Season 2.5 revealed to be October 19th, 2011. -10/19/11 Fact or Faked: Paranormal Files returned with Season 2.5 on Syfy. -11/30/11 Fact or Faked: Paranormal Files Season 2.5 Finale airs. -4/17/12 Fact or Faked: Paranormal Files returned with Mega Sized Season 2. 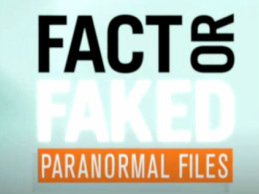 -6/26/12 Fact or Faked: Paranormal Files Season 2 Finale.